I feel like this is Urban Fantasy Week with some of the book backlog we're working through. 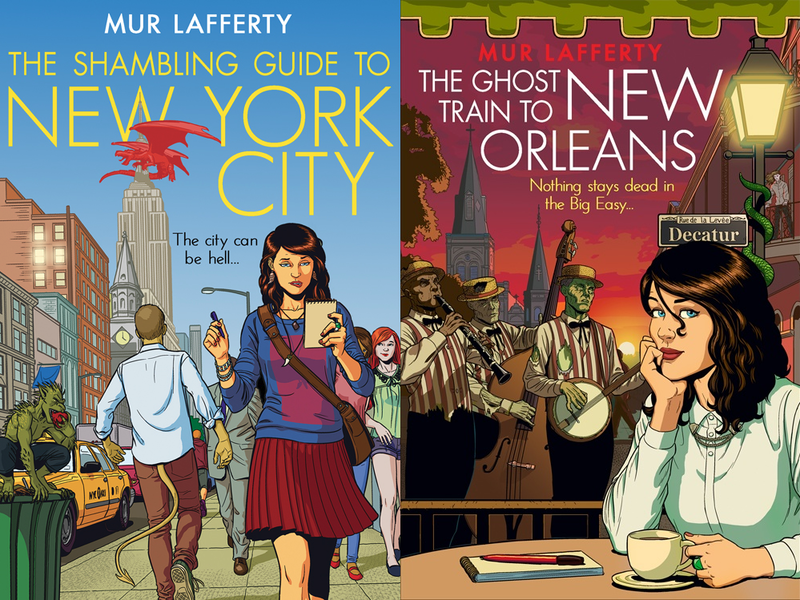 This time around, we're looking at Mur Laffery's Shambling Guides series, a different look at the existing urban fantasy genre. While I have a soft spot for so-called "chick lit," I'm finding I also have a significant soft spot for books with female protagonists who are also involved in urban fantasy comedies. This book in particular follows a writer who moves to New York City and gets involved with a publishing company that puts out books for the demons and supernatural beings in the city. Zoe interacts with vampires, zombies, demons, gods, and all sorts of other things while writing a travel book and solving a mystery surrounding her own existence. It's a really strange, unique premise that's handled very lightly and in a fun, readable way. It's like a nerdy summer beach read in a sense, and I'm totally great with that. And the cover is outstanding, and everything about this book is pretty much great. While I enjoyed the first book, the second entry in the series, The Ghost Train to New Orleans stays with the conceit but goes more serious than fun in a setting that might have called for more levity. I'm not completely down and out on this series at this point, and will eagerly look for the third entry. As far as where my expectations were, though, I was hoping for something more from the second book. Still, the first book might very well demonstrate whether it's worth your time.